Kerastase Elixir Ultime is recommended for all hair types and normal scalp. It has a variety of uses and lots of valuable properties. If your hair needs complex care and product with natural ingredients, start the treatment. Don’t wait any longer! When to use Kerastase Elixir Ultime? Go for Kerastase Elixir Ultime when your hair needs repair; it has lost its gloss; you cannot handle styling your strands. The product works inside and outside of hair; it also conditions the scalp. Use Kerastase oil during morning combing if you want to rebuild split ends, strengthen and moisturise your hair. It can also be applied when you hair and scalp lack active and nutritional ingredients. What are the properties of Kerastase Elixir Ultime? Kerastase Elixir Ultime Hair Oil adds smoothness, shine and softness. The product contains four vegetable substances that nurture the scalp. Corn oil delivers nutrients whereas argan oil shields from sunrays, salty water, free radicals and environmental pollution. Pracaxi oil strengthens hair bulbs, prevents hair loss and makes hair more resistant to damage. Camellia oil provides the strands with amazing and healthy shine. How to use Kerastase Elixir Ultime? There a few ways of using Kerastase Elixir Ultime hair oil. Apply the product prior to styling, to damp and clean strands. Then, blow dry and style as always. You may as well apply the oil after styling for shine and longer-lasting effect. 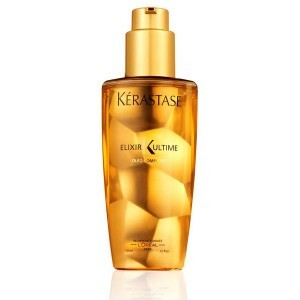 Kerastase Elixir Ultime works great in daily haircare. It protects the strands from damaging external factors, provides nourishment and helps to tame unruly fly-aways.